春、来てます。　Spring is almost there. 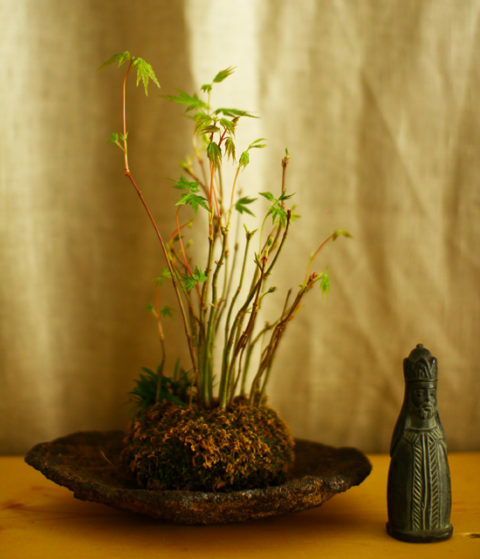 Lately, ahead of the trees outside, Bonsai of maple we growing in our house got its new leaves. Since it is too cold these days, we were almost doubting the spring’s coming which continues to the summer, but it seems spring is almost there. According to the forecast, the temperature of Kobe will raise far above 10°C tomorrow. I’m continuing to sitting on a piano chair. As we thought, we are excited about the spring’s coming. With feeling a little apology to cold cold winter. Photo: The maple tree Bonsai with an old seal from Gondar, Ethiopia.